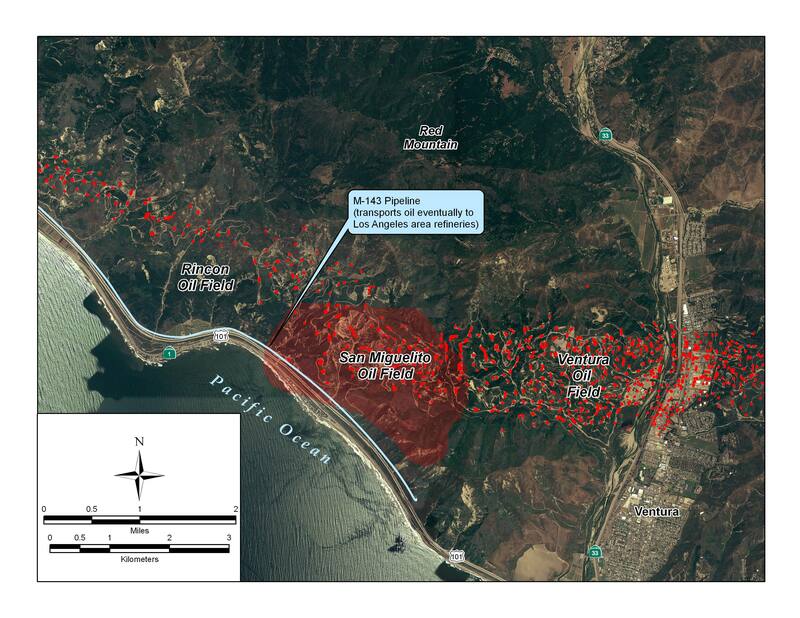 The current Solimar Beach Fire raging north of the City of Ventura is threatening numerous oil drilling and storage areas adjacent to Pacific Coast Highway along the Rincon coast of northwestern Ventura/southeastern Santa Barbara County. As of 17:00, Ventura County Fire is reporting 100% containment with only about 70 personnel on the ground engaged in mopping up efforts. Officials revised the burn area to 562 hectares (1,388 acres). At last report, all oil and gas facilities were reported undamaged. The same goes for homes and buildings: no significant damage. We have seen some awesome sunsets across Ventura County these last two nights. The particulates in the air over the western reaches of the county are not posing a health threat (they are primarily blowing right offshore), but are treating us to some wonderful colors. 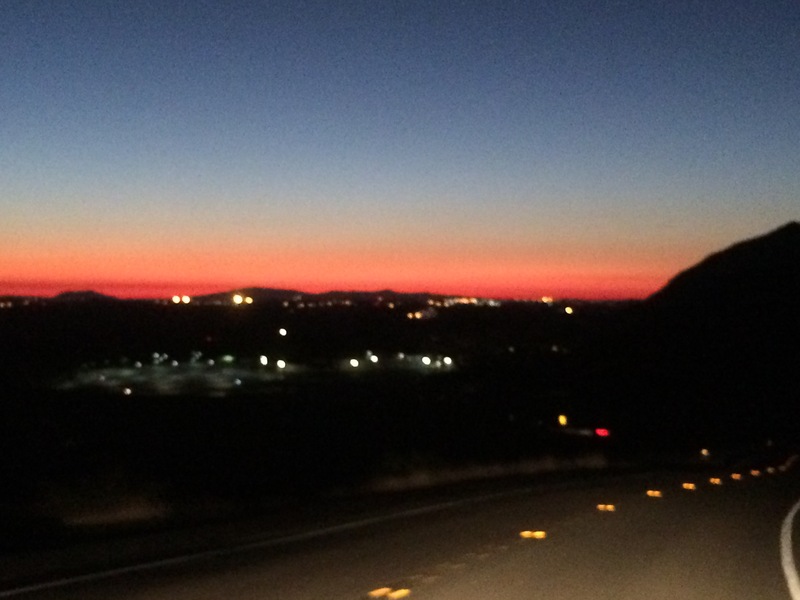 Sunset from W Potrero Road above our CSU Channel Islands campus. Boxing Day, 2015. Fire officials were reporting 75% containment as of 17:30 Sunday night with fire personnel on scene down to 335 people. 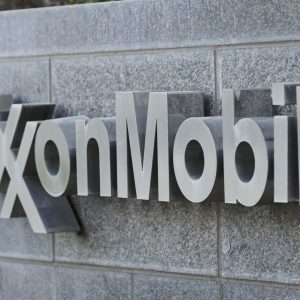 Officials also disclosed the oil operation at the ignition site was part of the holdings of California Resources Corporation. The active front has moved well inland from PCH. 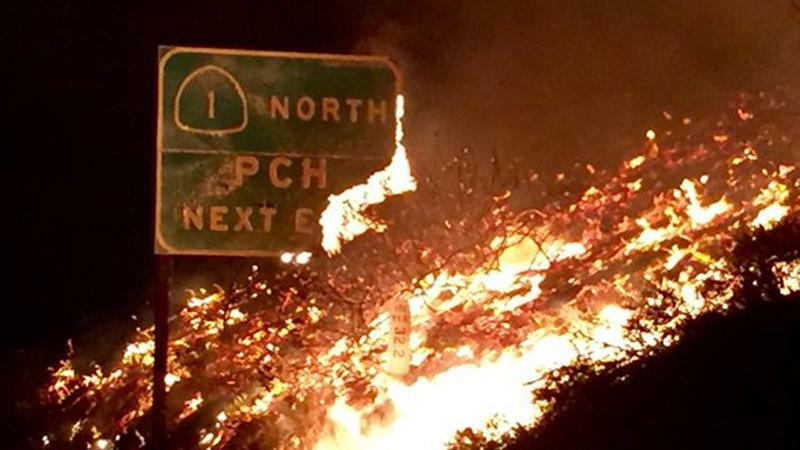 Comparatively little scorching happened in the immediate coastal zone, with flames apparently jumping PCH over less than a linear mile of freeway. 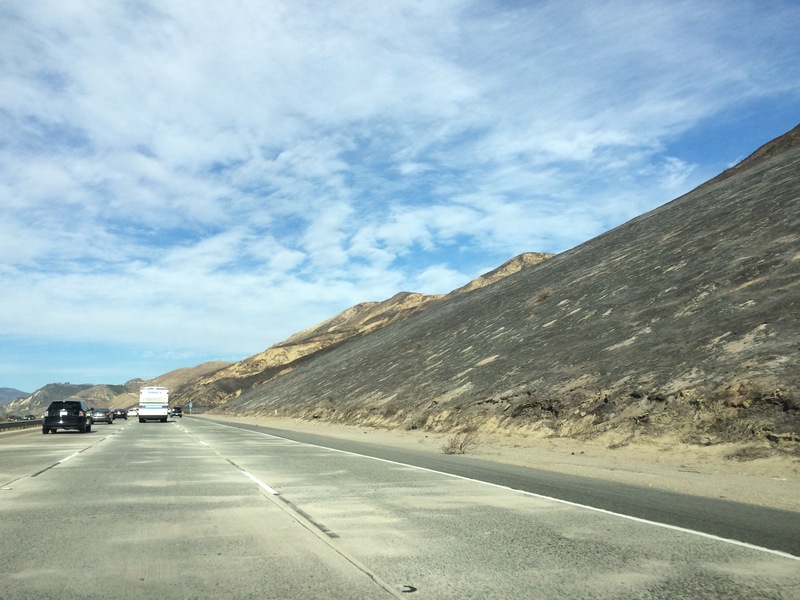 All told I saw burned hillsides over no more than a five mile stretch of PCH as I drove the area earlier today. 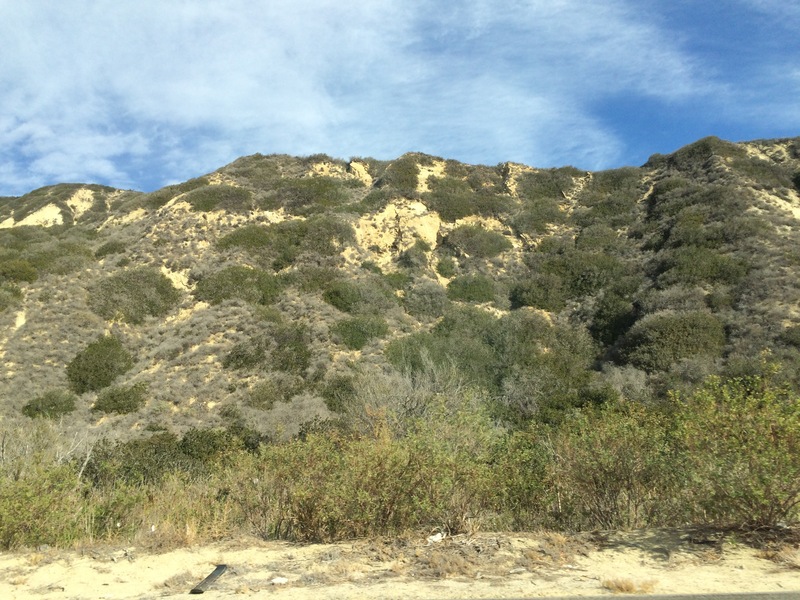 Coastal hillsides along the Rincon section of PCH. This gives you a good idea of what the vegetation looked like as of two days ago (pre-burn). 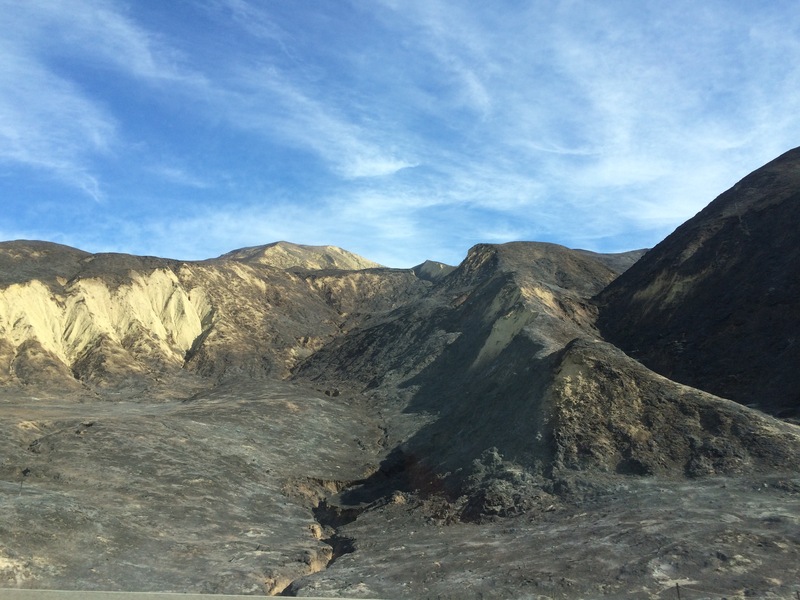 Coastal hills along the Rincon section of PCH midday on December 27, 2015. See the latest from the VC Star. 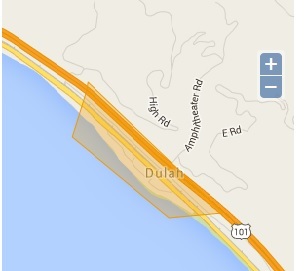 Ventura County Fire Officials are now reporting 70% containment. Staffing is a bit down from yesterday at a reported 426 firefighters on scene as of this morning. The cause of the blaze has now been confirmed to be private power lines that were blown down by high winds. These were on an oil production company’s property. There were near active wells, but those wells were apparently not damaged. 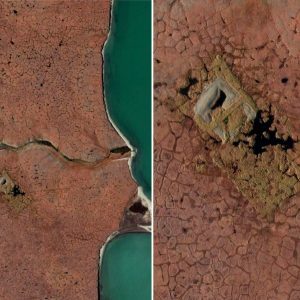 Usually these areas are devoid of vegetation. See the latest from the VC Star and LA Times. All lanes of PCH and all rail service had reopened at of mid afternoon as winds have continued to slacked throughout the day. 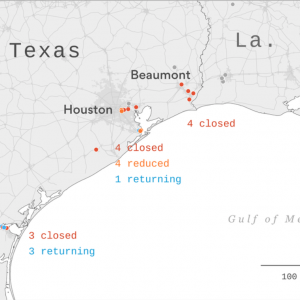 The immediate coastal zone and associated oil infrastructure is mostly out of danger at the moment. Ventura County Fire Department is reporting 60% containment as of this evening thanks to the huge support in both manpower and air support. A Ventura County Fire Department engine on PCH as flames range from the Solimar Beach Fire burning just north of Ventura on December 26, 2015 (Image: Ryan Cullom). 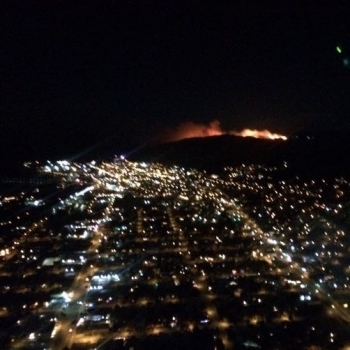 The fire viewed from the city of Ventura (Image: Ventura County Fire). 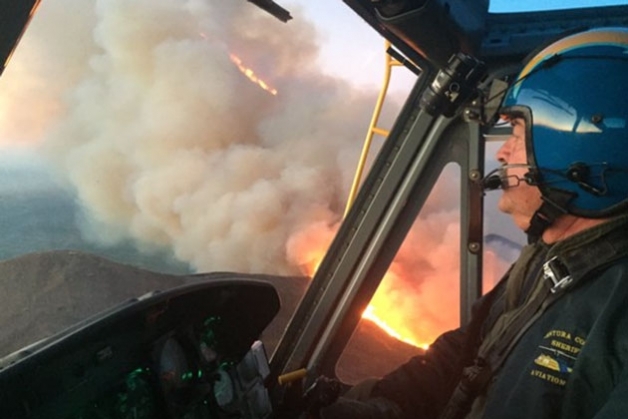 Solimar Fire from the cockpit of a Ventura County Air Unit Copter 7 making a pass on the morning of December 26, 2105 (image: tweet from Ventura County Air Unit). 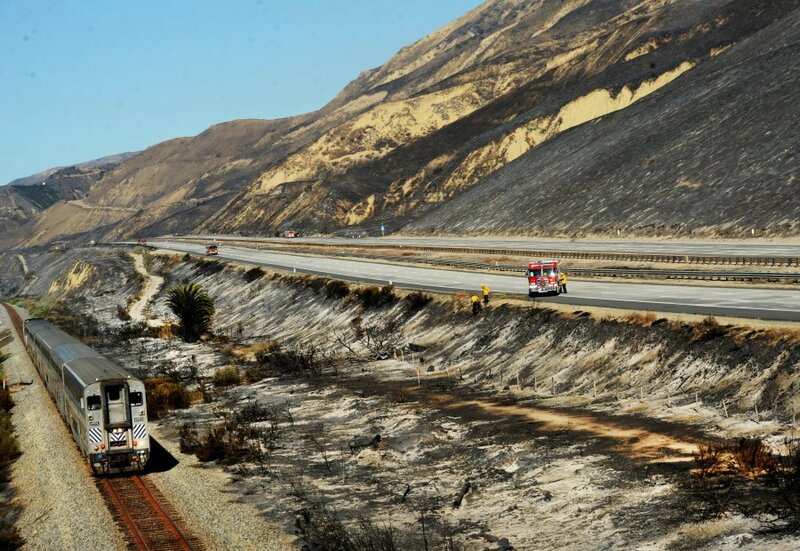 A train passes a burned segment of hillside e along PCH just North of Ventura, Boxing Day, 2015 (Image: Chuck Kirman/Ventura County Star). A fast-spreading, offshore wind-whipped wildfire has burned as estimated 480 ha (1200 acres) of coastline (as of the 11:00am press briefing on December 26, 2015) near Solimar Beach north of Ventura, California. 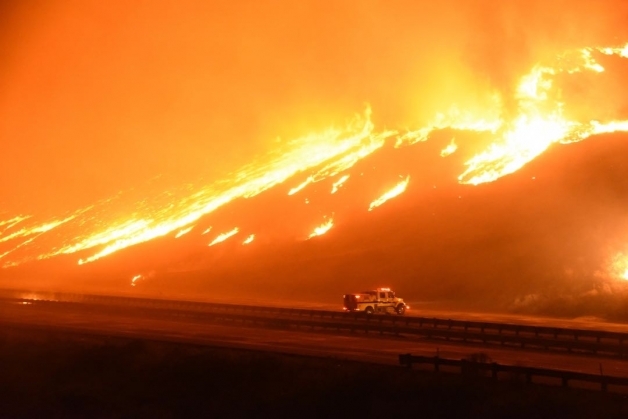 The fire has prompted mandatory evacuations along the nearby beach enclaves and a complete closures the 101 Freeway (aka Pacific Coast Highway aka PCH) in both directions as of early Saturday morning. Rail lines which parallel the freeway along this section of our coast are also shut down until further notice. Ventura County Fire personnel are working the fire with more than 600 fire fighters on scene or en route to the fight the fire. The flames are being pushed by a strong northwest wind and currently poses a potential threat to oil, gas, power and rail infrastructure. 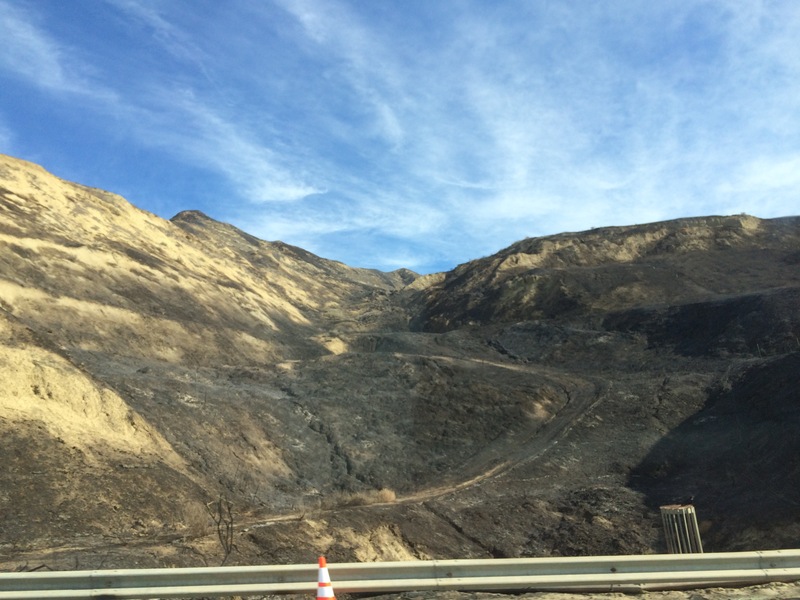 Ventura County Fire estimating it will take them about three days to get full containment. While the actual ignition has yet to be determined, the fire appears to have begun around 10:30 p.m. Christmas night near the 3000 block of West Pacific Coast Highway. Overnight flames were within 50 m (150 feet) of the sand and various of our long-term sandy beach monitoring sites. Solamar Beach Fire freeway closures as of Boxing Day, 2015. Fire officials claim to be on cautiously worried about oil and gas facilities in the vicinity, citing the fact that oil companies have cleared ample brush around the perimeters of their operations and are now working closely with emergency personnel to avoid any problems. 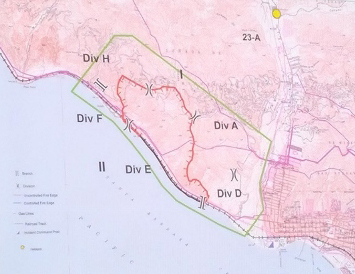 Detail of the San Miguelito oil field partly threatened by Solamar Beach Fire. Red dots are locations of active oil wells as of 2008 (image: Wikicommons). Union Pacific Rail, PCH, and the 101 Freeway from State Route 33 to State Route 150 were closed as of early morning on December 26 given both the proximity of the fire to the roadbed and the fact flames were sporadically jumping PCH itself and igniting vegetation on the seaward side of the roadbed. Given the complete closure of the Rincon, the alternative route for this major north-south corridor was via the 150 and 33 highways. As someone who regularly drives this twisting, curvy route, I was relieved to see that the California Highway Patrol recommended big rigs NOT take State Route 150. Our lab is uniquely positioned to quantify the potential unintentional consequences of this necessary, altered traffic flow. More on this later, but in brief we have been monitoring wildlife road kill across southern California roads for the past decade and have robust estimates of how many critters are killed on more than 50 roadways in and around Ventura County. 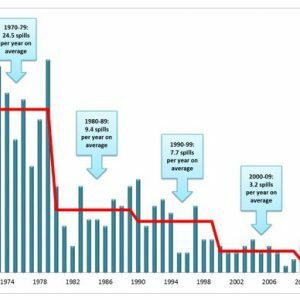 As the 33 is one of our most intense concentrations of road kill in the county, I estimate that as we boost the traffic flow along the 33 and 150 highways, we will see perhaps an additional 58 animal kills that we would not have seen had the bulk of the traffic remained on PCH/had we not had this fire.